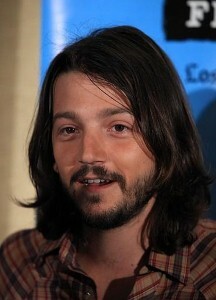 Wherever actor Diego Luna goes, he has a little memento from his son that he carries with him. "I have a little spit up on my shoulder or a spot of carrot puree on my pants," said Luna in an interview with Parade. "There’s toys everywhere. So he’s with me everywhere." Luna became a first-time parent last year when he and his wife, actress Camila Sodi, welcomed their son Jerónimo on August 9. When asked how it felt to become a father, Luna stated that it "is the biggest change you go through in life" and that there was no way to predict the love he would feel towards his son. "It’s a love that people tell you about," Luna told the news provider. "You read about it. You think you know what it is. You think you know how it’s going to feel. And then, phew, when it happens, you realize there’s no way to predict this. It’s so unique, so perfect." The 29-year-old actor is currently promoting his new film Rudo y Cursi, which is about two brothers fighting over who is better at professional soccer. The movie reunites Luna with Gael Garcia Bernal, his costar from 2001’s Y Tu Mama Tambien.